After visiting four doctors in four states to cure a problem that could be affecting his livelihood, a man, desperate, decides to head to Canada to receive treatment that the arcane American health care system can't provide for him. 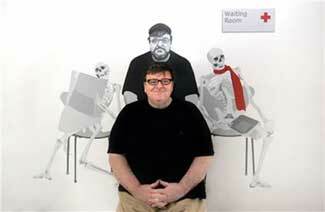 A scene from Michael Moore's Sicko. Nope, something even more gruesome: The Washington Nationals rotation. John Patterson's quest for treatment on his ailing right arm will continue with a stop to see yet another doctor, this time to get injections that Patterson hopes will relieve the strain on a nerve. ... The righthander will travel to Toronto to receive treatment that Manager Manny Acta said has not been approved in the United States. Well, at least he didn't go to Cuba: They'd probably never let him come back. And a man of the stature of John Patterson should never be forced to travel back to his homeland on a banana boat.